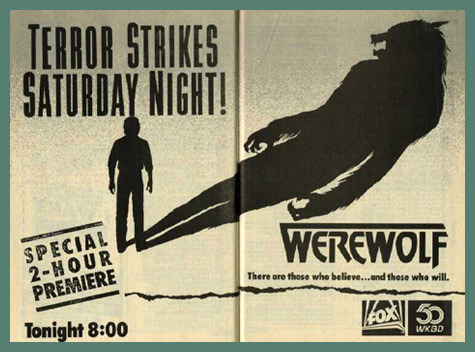 When Werewolf premiered on Fox in 1987, I was instantly hooked. 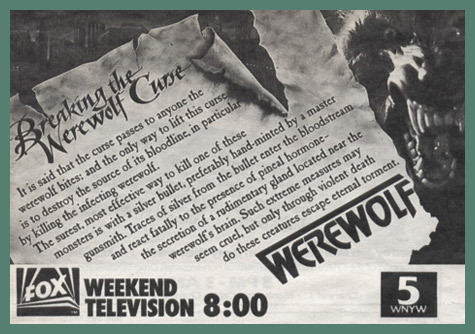 A prime time show about a handsome werewolf trying desperately to cure his lycanthropy? What’s not to like? 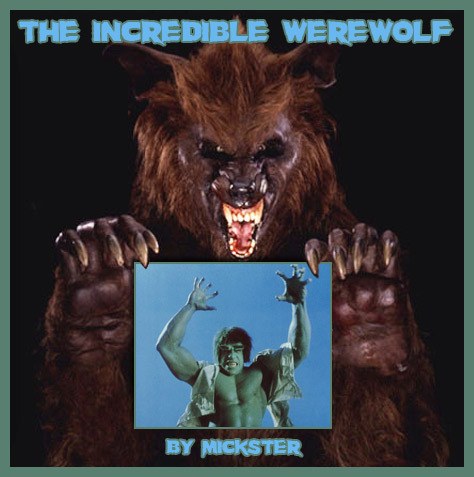 When the Chiller Channel began airing episodes of Werewolf a few years back, I was stunned to realize that Werewolf and The Incredible Hulk share many of the same qualities. I loved The Incredible Hulk when I was a little girl, so I am surprised it didn’t occur to me back in 1987 that Werewolf is essentially The Incredible Hulk. Not convinced? Sit back and I will explain. Eric Cord (John J. York) and David Banner (Bill Bixby) were changed by freak circumstances. Eric’s best friend, in werewolf form, attacked him, and David was altered by an accidental overdose of gamma radiation. “Alamo” Joe Rogan (Lance LeGault) and Jack McGee (Jack Colvin) are essentially the same character. Each is relentless in their pursuit of their quarry, “Alamo” Joe as a bounty hunter and Mr. McGee as a tabloid reporter in search of a juicy scoop for his paper. Eric and David stumble upon people in need, as they search for a cure for their alter egos. In “The Boy Who Cried Werewolf,” Eric hid in a young boy’s tree house eventually helping the boy and his mother from her abusive boyfriend. In “Death in the Family,” David saves a young, crippled girl whose evil family members are plotting her death, so they can inherit the family fortune. While in the form of their alter egos, Eric and David never harm innocent people even though they are supposedly unaware of their actions during the change, which shows their goodness. Eric and David must move on at the end of each episode before their pursuers catch them and to continue pursuing a cure to rid them of their alter egos for good. Eric is in search of the originator of his “bloodline” that, at first, he thinks is Janos Skorzeny (played by a scary-looking Chuck Connors) because killing the “head” werewolf will cure his lycanthropy. David, a physician, tries to cure himself and is constantly seeking the means to do so. See? Werewolf and The Incredible Hulk are the same show! It is a shame that Werewolf only lasted one season. I thought and still think that it is a cool show. So, are there any Werewolf fans out there that agree with the Mickster? Thanks Mickster! I have never seen “Werewolf”. I think it came out the one year I had no TV. I remember you talking about it before and I thought you were talking about WOLF LAKE. I’m sad it’s not on DVD, it looks like some music licensing problem from what I read. Hate that. 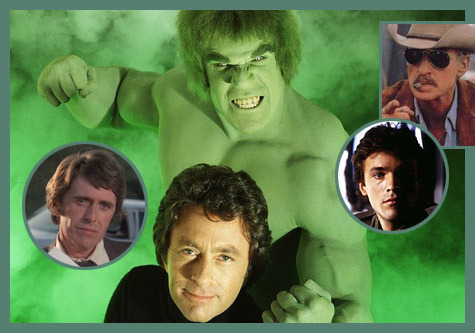 Also, thanks for bringing back such fond memories of The Incredible Hulk and the great Bill Bixby. Currently all five seasons of that show are on Netflix (but sadly the later TV movies are not). I’m with you, Mickster! Two great shows but only one made it to DVD and Netflix. Love the homage to Kolchak in “Werewolf”. I loved it, as well, and also wish it had gone on longer. One season? What the hell? However, John J. York went on to become Mac Scorpio on General Hospital and he eventually became one of my favorite characters, so I guess one good thing came out of the end of Werewolf. Ozne, You have to tell me about this Kolchak reference in Werewolf. I was just watching Kolchak on Netlfix the other night. I was thinking about doing a traumafession on “The Spanish Moss Murders” because that episode really got to me as a kid. I know! I know! Janos Skorzeny was the name of the vampire in the TV movie The Night Stalker. Yay! I am so glad to see the love for Werewolf from Ozne and Caffeinated Joe! The Incredible Hulk was my favorite show as a kid. The theme song made me depressed every time, he was soooo lonely!! Also, the episode where Bruce meets another, uglier Hulk seriously traumatized me! So, if Werewolf is similar, it should be a blast to watch! 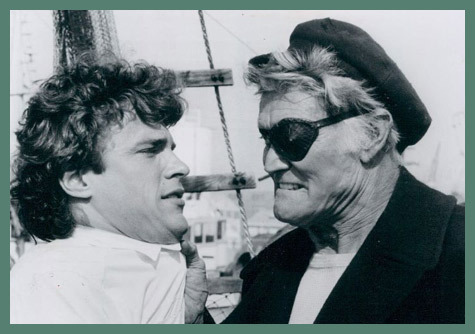 Chuck Connors with an eyepatch looks a little familiar, so I’ll have to see if perhaps I caught an episode back then. Also, the youtube user whose link you provided to the pilot episode seems to have uploaded the entire season. I haven’t checked all the videos, but it looks complete(click on “playlist” in the upper left hand corner to view the episode list). Darkko, I think you will enjoy it. The pilot is a bit draggy at times, but it is worth it. The regular episodes are shorter, so the pace is better. I am glad you found that playlist. I found a copy of the series at a Monster Mania in 2011. Let me know what you think after you watch. Also: in the earliest issues of the comic book, Bruce Banner turned into the Hulk during a full moon. That’s some cool trivia I did not know. Thanks, Kevin!